A powerful little device, significantly brighter than others of its size, with decent battery life and a good picture. Too bad it’s so damn loud, and not the most user-friendly thing of all time either. 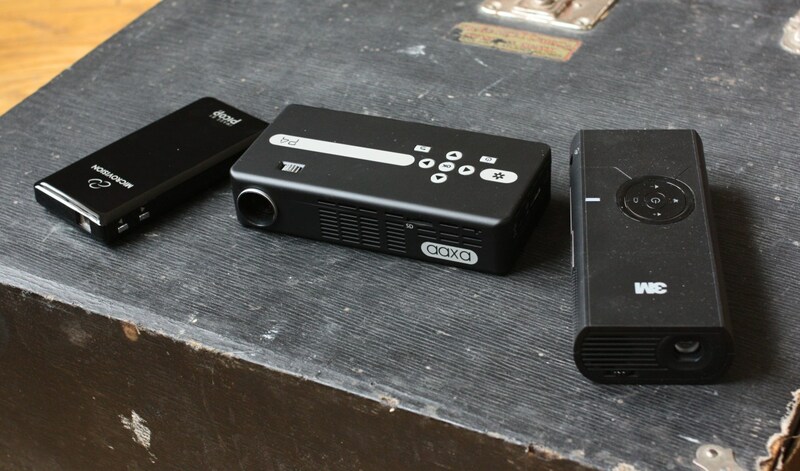 The line between “pico” projector and simply small projectors is increasingly blurry as we see large-ish but still not large products like 3M’s MP160 and the upcoming Shine. They won’t fit in your front pocket, but they’re sure more portable than traditional projectors. 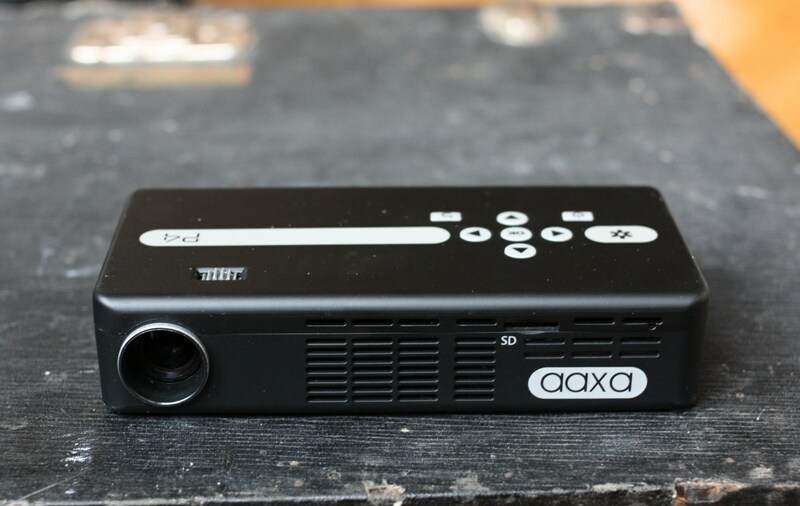 AAXA’s P4 is of a type with these: portable, but not micro. It’s a boxy, gadgety-looking little device, with the controls on the top, inputs and outputs on the side, and USB stuff on the back. It comes with a controller of dubious quality — instead of arrows, the buttons are labeled “up,” “right,” and “Sour” (source), that kind of thing. Don’t expect a very short throw on the image – but at the same time, it’s not as long as others I’ve used. At 6 feet away, I got about a 35″ image. They claim 80″ is possible in low light, and I don’t doubt it – but you’d need quite a bit of space. For small environments like offices and apartments, you’re probably going to be getting 35-50″. Battery life is somewhat more than an hour, but less than an hour and a half. 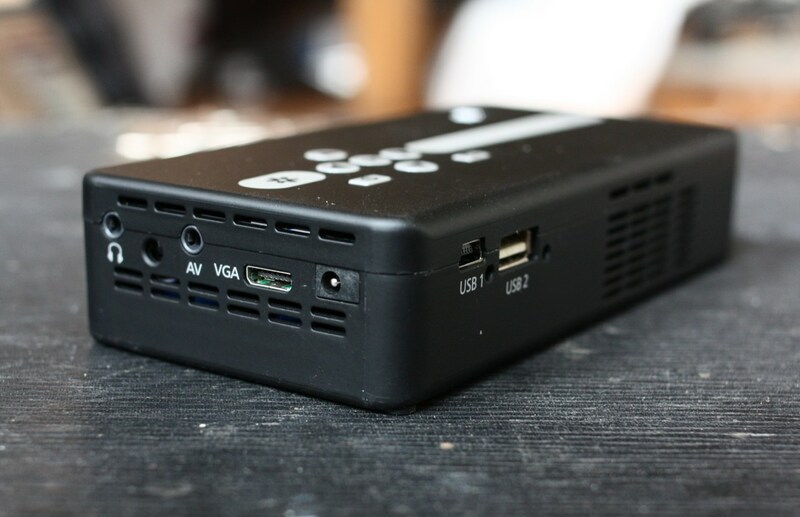 This is par for pico projectors, though notably the P4 is brighter than its brethren. Upon starting the device up, you can choose between playing on-device videos, pictures, and music (music, really? 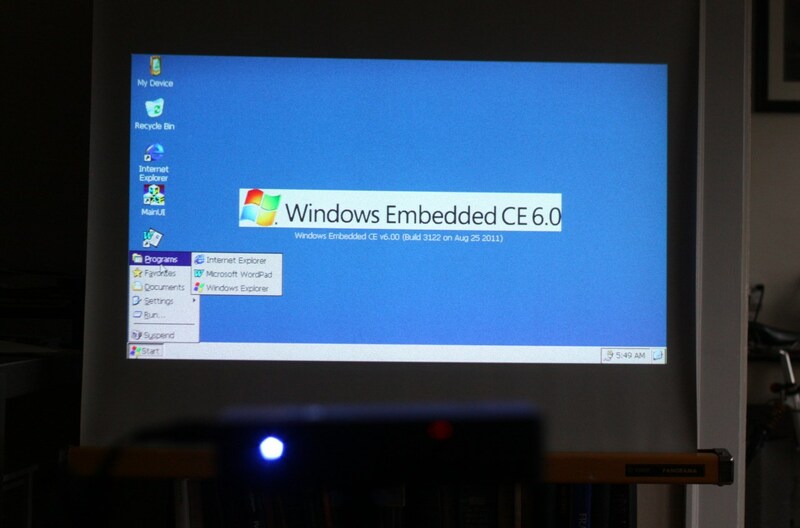 ), going to a connected source, or entering a full-on Windows CE desktop. The only one I didn’t have trouble with was the plain pass-through source; my SNES and laptop signals were clear, sharp, and bright, with solid color, no visible artifacts or optical effects, and no lag. That said, a card with a couple dozen pictures and movies on it loaded very quickly. Unfortunately, media playback wasn’t the best. Anything larger than VGA tended to choke and stutter, whether I had download it or made it myself (AAXA tells me this is not a problem via the mini USB port, and may be fixed by firmware). So don’t expect to be watching HD movies on this thing, despite its relatively high-res image. And when it didn’t stutter, sometimes it would not respond to controls or fail to hide the on-screen display, resulting in much of the image being obscured by buttons and a filename right in the middle of the video. Note that this does not apply to videos played through another device, like an iPod or laptop. Photos looked all right, but large ones (~4MB, 3000x2000px) took around five seconds to load. 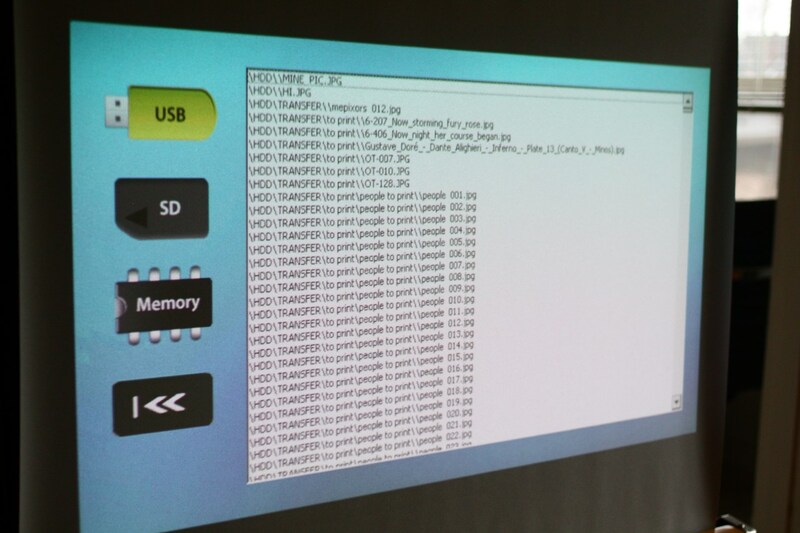 It supports JPG, GIF, and BMP, but not PNG. PDF files are not opened natively; you have to go open them in WinCE mode via Foxit Reader. And throughout all of this, there is a white Windows cursor in the middle of the screen. Why?! Probably because it’s all running on top of Windows CE, which you can switch into by going to “Desktop” mode. It’s actually pretty cool, although without wireless capability it’s quite limited; if you want to add programs you have to transfer them over USB or figure out a way to share your net from your PC. It’s kind of great that there’s a whole little Windows computer in there, but unless you really want to spend some time configuring it, there’s not much it can add to the bargain. Especially since it’s very difficult to navigate with the clicker. AAXA was nice enough to pack a tiny keyboard/touchpad combo thing, which works perfectly with the projector and is cute as hell. I like this little thing. If the Windows portion of this projector were more practical, this would be very handy indeed. Lastly, the thing makes a racket. These larger pico projectors aren’t generally too quiet to begin with, but this thing starts whirring from the moment you turn it on, and there is a high pitched noise that’s added when an image is being produced. It also doesn’t have much in the way of volume so you’ll have to pack speakers if you want to hear what’s being said in videos over the din of the fans. While the P4 is well-built, compact, and produces a really bright and solid picture, its other features are just not very usable. To be fair, the others in the space are often just as poor performers: I haven’t met a pico projector yet that provides a satisfactory movie-viewing experience or is actually easy or fun to navigate. 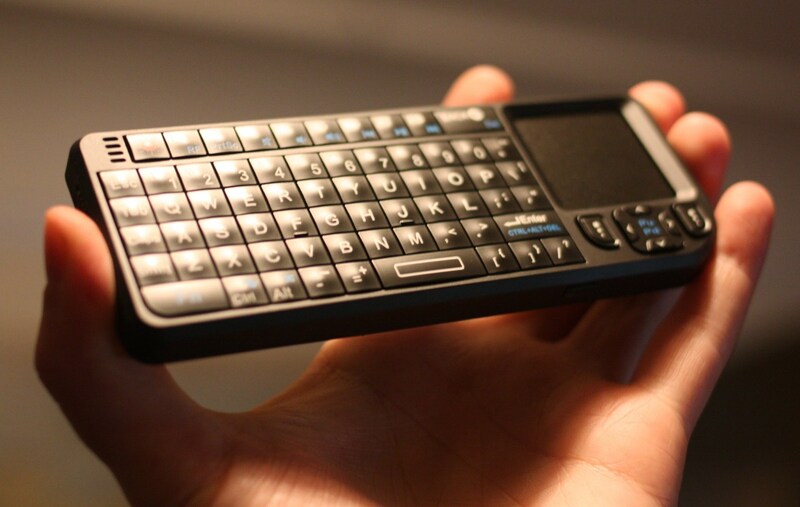 If you want a multimedia device, the P4 isn’t for you. If you don’t mind the noise and plan on doing mostly pass-through stuff from other sources, it could be just fine. They do have a smaller, slightly less bright version coming out (the P3) which might be a little more practical, but that doesn’t come out for a few months.